Have you ever fallen in love with a name? with a place? well… that is the feeling… when you hear the name Nairobi (the capital of Kenya) for the first time, it is like some beautiful girl you were always attracted to but could never get. Well, the name Nairobi is quite far from that: it comes from the Maasai Enkare Nyrobi which means the place of cool waters, which is also the name for the Nairobi River which lent its name to the city. Today, it is popularly known as the Green city in the sun… probably because of its lush-ness. 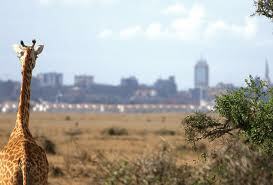 Nairobi hosts a natural reserve protected, the Nairobi National Park, within its borders. It is also the capital hosting the most species of birds in the world. Nairobi was originally built at the beginning of the 1900s as a railway link between Mombasa (on the coast of Kenya) and Kampala (Uganda) by the rail company Kenya Uganda Railway. It was completely rebuilt in the early 1900s after an outbreak of plague and the burning of the original town. Its location was chosen because of its central position between Mombasa and Kampala; it was also chosen because its network of rivers which could supply the British camp with water and its elevation which would make it cool for the British residential purposes. In 1905, Nairobi replaced Mombasa as capital of the British protectorate, and from then on grew tremendously around tourism, administration, and big game hunting. 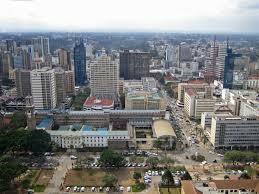 Britons came to live in Nairobi for for game hunting. In those times, the city quickly became the commercial centre for the colony’s coffee, tea, and sisal industry. Today, Nairobi is one of the most populous cities in Africa known for its beauty, for its versatility, and also for its slum Kibera. The city of Nairobi is located on the eastern edge of the Rift valley, with the Ngong Hills located to the west of the city, and Africa’s two tallest mountains, Mount Kenya and Mount Kilimanjaro are located to the north and towards the southeast, respectively. 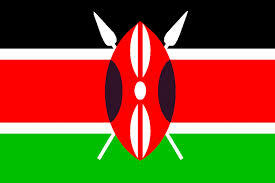 It was also the birthplace of Kenya’s first president, Jomo Kenyatta. Enjoy the great Congolese singer M’Bilia Bel (she is also a beauty) singing about the beautiful Nairobi, Nakei Nairobi, a song written and composed by Tabu Ley Rochereau. 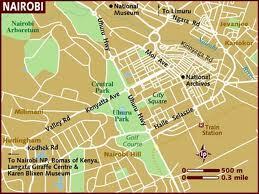 Have you ever been to Nairobi? What were your impressions?